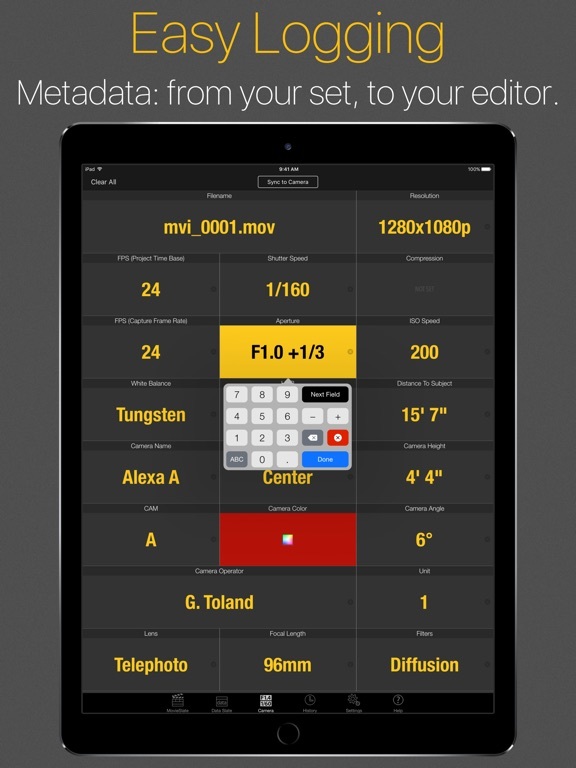 One of our favorite iPhone apps just graduated to the iPad. Not only is it bigger, and prettier, Movie*Slate 2.0 has added some very impressive, and professional features. Rather than just list the new bells and whistles, I decided to contact the app’s author, Cliff Joyce of Pureblend Software... and let him list all the bells and whistles. Here’s what Cliff had to say. HHH: What features have you added in MovieSlate 2.0? CJ: Timecode Sync from Camera. 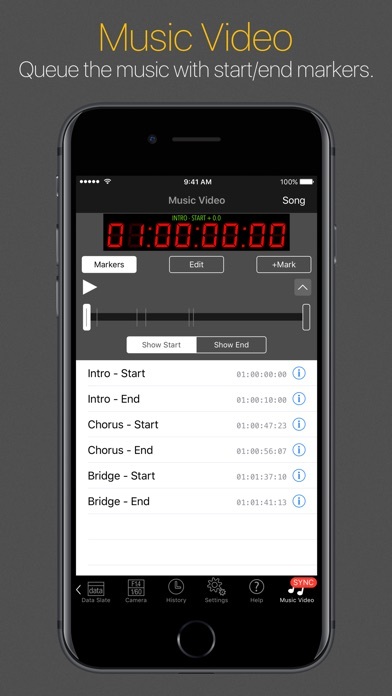 Run an audio cable from a camera or timecode generator to the headphone jack of your iDevice (iPad, iPhone, iPod touch). MovieSlate then acquires the external timecode. HD-Optimized for iPad. 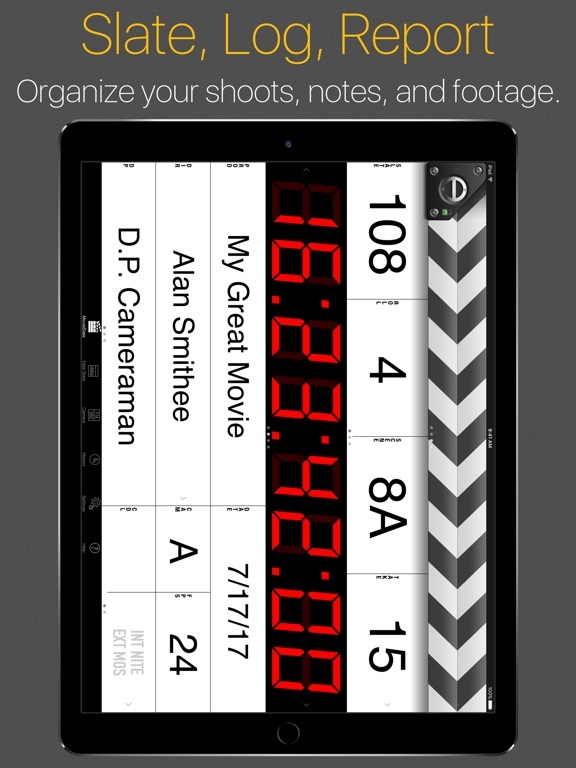 Since the iPad is about the physical size of a traditional clapperboard, this made tons of sense. Optional Data Fields. The main slate screen now supports six additional data fields. To access the fields, swipe the clappersticks or timecode display to scroll them left/right. Customizable field labels. Each of the optional data fields can use your own custom labels. The labels appear in shot logs, and can be unique to each shot or production. Create notes before starting a shot. Previously you could make a text, image, or voice note after starting or ending a shot. 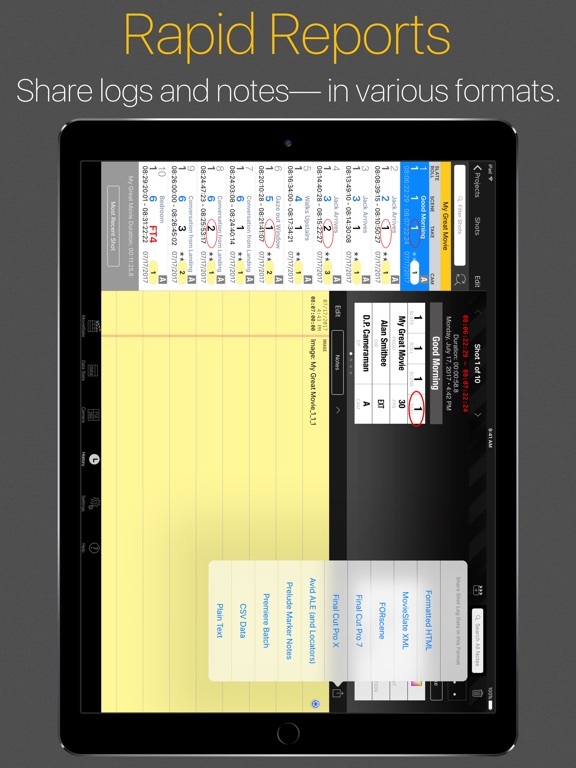 Now you can make a note beforehand. ColorChart and GrayCard. The slate now has buttons to display these charts full screen. Tap anywhere on a chart to dismiss it. Many smaller fixes and user interface improvements that add up to a more enjoyable, streamlined experience. HHH: What feature request did you hear the most after your initial release? CJ: Hand’s down, Timecode Sync from Camera (LTC-IN). As easy as we made it to manually jam timecode, professional filmmakers told us that they really wanted a more automated solution for acquiring timecode. Our sync solution works with any camera or timecode generator that supports LTC output. With LTC output, the camera sends timecode data as audio pulses through a patch cable. I think our implementation is pretty slick. 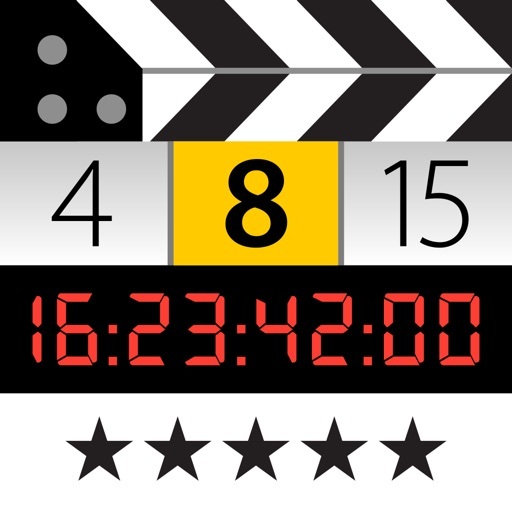 The camera’s timecode is displayed in MovieSlate and stops/starts when the camera does. When you unplug the audio cable from the iDevice, MovieSlate auto-jams the timecode. 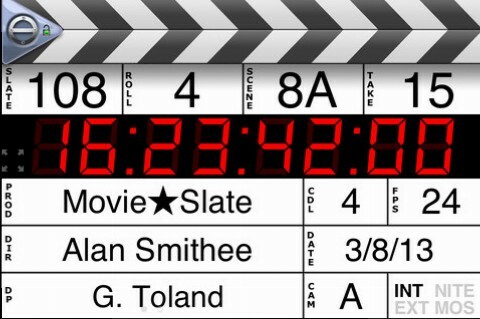 Plug the cable back in, and MovieSlate acquires the live timecode signal again. You can also force-jam the timecode using an onscreen button. HHH: How difficult was it to add the timecode syncing functionality? What sort of testing did you do? CJ: Yeah, it took a significant amount of engineering– and testing. We had a pretty large group of industry professionals who pitched in as beta testers, subjecting the feature to a variety of cameras and workflows. We learned a lot from them, and cannot thank them enough for their invaluable feedback. HHH: So you consulted with professional filmmakers while developing MovieSlate 2.0? CJ: Yes, for both design and testing. Many MovieSlate users have requested features to help streamline their workflow, and have been kind enough to send us detailed workflow descriptions. We’ve discovered that there’s really no standard way of working, and have therefore tried to make MovieSlate very very flexible. HHH: Why did you choose to make the timecode syncing function an in-app purchase? CJ: We have a significant engineering investment to recoup. We realized that not everyone can use or needs to use the timecode syncing feature. So to hold down the app’s base price, we decided to offer the Sync Timecode from Camera “PRO” module is an optional $49.95 in-app purchase. For PRO users, the price point is quite reasonable– particularly when contrasted with the cost of a traditional digital slate– or even a desktop application. HHH: You had originally planned to release an iPad only version called MovieSlate HD. 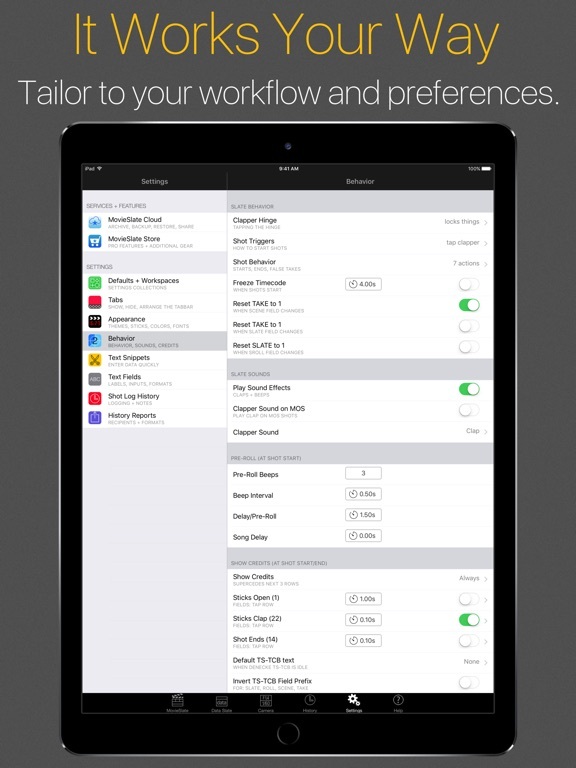 But instead you’ve released MovieSlate 2.0 as a universal app, able to run on both the iPhone and iPad. What changed your mind? First, many of our customers use MovieSlate on more than one device. With the current App Store architecture, publishing two separate apps would require users to pay twice for in-app purchases of PRO modules (like the “Sync Timecode from Camera” capability). We think that’s not a good way to treat customers. Second, we wanted a more unified feature set for both the large screen (iPad) and small screen (iPhone, iPod) versions. When we began the “HD” version for the iPad, we re-envisioned how people interact with every aspect of MovieSlate, given the iPad’s larger screen real estate. Funny thing is, some of that thinking spilled over into the smaller screen version as well. It actually made more sense to join the two apps into a single, unified code base. HHH: Are there features you had hoped to add, but couldn’t? LTC-OUT. Sync timecode to Camera. This will turn MovieSlate into a full-featured timecode generator (at a fraction of what we paid for our Horita TC generators!). 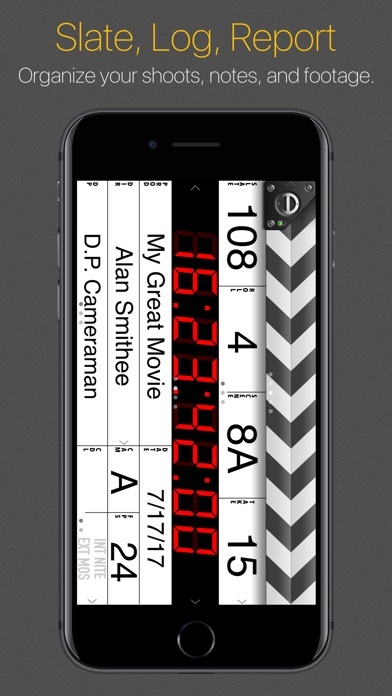 On a multi-camera shoot, you could audio cable connect your iDevice to several cameras and audio recorders, then use MovieSlate to send the master timecode to each. WiFi Timecode Syncing. It would be great to wirelessly transfer timecode data. We do this now between iDevices over Bluetooth. But doing it over WiFi potentially allows us to connect to other kinds of devices like Macs and cameras. Enhanced Music Video system. During beta testing, we heard from many music video production companies. They gave us some really cool ideas on improving MovieSlate for their workflows. HHH: What other apps have you developed? CJ: After we published MovieSlate, we heard from lots of kids and parents who wanted a customizable slate to use for fun in home moviemaking. So we wrote MovieSlate’s silly little brother, ToySlate. Music is a huge interest here at PureBlend. The iPod app works really well, but we all wanted a music player with quick access to everything on one screen; with gestures to quickly change songs without looking (while driving) ; and a customizable user interface with themes. So we developed TuTuneMe. We’re interested in speeding up text input, so we wrote a template-based mail merge program called Maildash to send emails and text messages as quickly as possible. Like any self-respecting App Store developer, our first app had to be either a Fart app or a Tip Calculator. We’re a classy bunch, so our tip calculator is called BigTipper (based on one I wrote for the Newton. Remember the Newton?). BigTipper also saves meal tickets for expense reports. We’ve also written a number of apps for larger companies which are not published as PureBlend products. HHH: Any plans to develop more apps for mobile media makers? CJ: Yes. 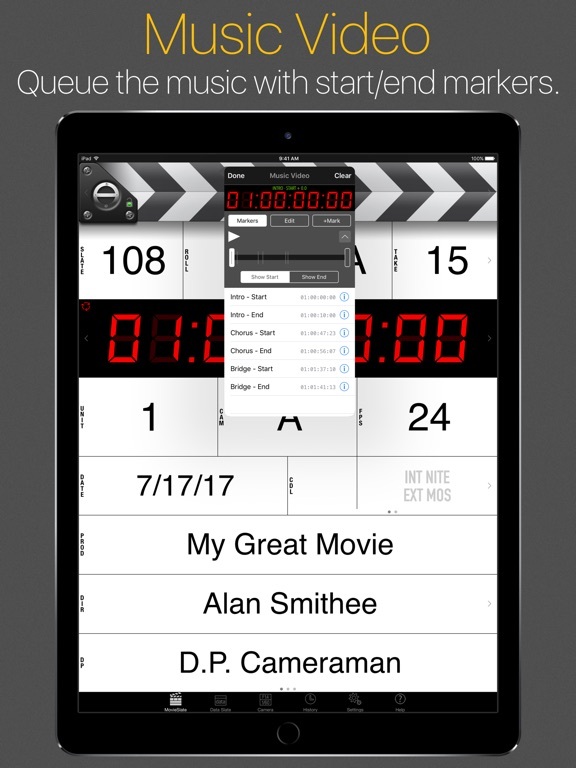 We’re working on more MovieSlate modules, and have a few other movie making app ideas. The big question is: Is there any timecode drift? How often do you need to re-sync? 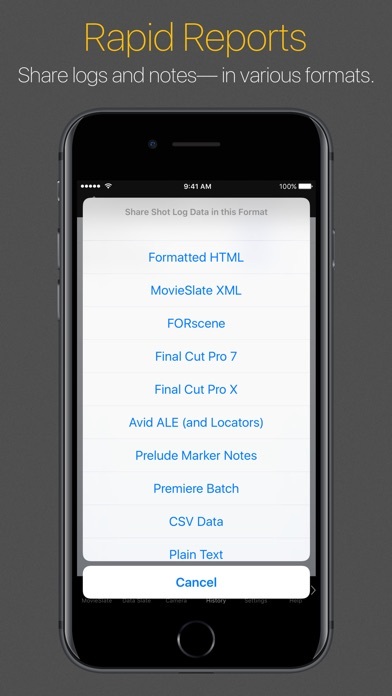 So long as the iOS Device and Camera are tethered, there is no drift because MovieSlate is just reporting the timecode it receives from the camera’s LTC output. When you untether, the timecode gets jammed. There is no apparent drift (tested over a 2 hour period), but there is a quarter second lag that we are currently investigating and will have a fix for in the next rev. I downloaded this a couple of days before a production so I could familiarize myself with it and go through its extensive built-in help. Specifically I wanted to use it for a music video I directed where we had no script supervision. The hope was that we could use the music video mode to get right into specific lip-sync playback scenes, generate notes and "ins" and "outs" for the editor via the log. The app is beautifully done and quite complex and customizable. Testing it before the shoot I felt very confident about using it. I set it up to start at a specific portion of the song, and end after the scene. Very cool, but buggy. In this mode, with the iPhone 4 and iOS 4.01 and 4.02, there is a bug that silences playback after the first take or two. It may be that the phone sleeps and causes the audio to fail. You get the count down beeps and clapper sound, then all is silent instead of getting playback sound. This is not random, but repeatable. VERY FRUSTRATING when the camera is rolling and talent is ready to go. The work-around is to go into the "music video" tab after every take and re-choose the song, then re-set the intro and outro points. Very time consuming and frustrating. There is a "checkbox" for keeping the iPhone from sleeping, but it appears not to work with this hardware/software combo. Another problem we encountered in the field was that once you end (or in our case in Music Video mode, the App ends) a take the mode goes straight back to Slate mode instead of staying in script-note-taking mode. On set, it often requires a video playback to ascertain if a take should be "circled" or if the video or audio is good. The app seems to think you’re going to ONLY make notes during the take, requiring you to tap the screen repeatedly to get into the history/project/scene/shot/take/notes area to do what you need to do. I can’t find a way to alter this in the behavior tab. Additionally, when we used the "history" mode to update take notes, it repeatedly crashed completely if you tap the "pencil" icon indicating you wanted write a note. This is exactly the sequence and action that on-screen-prompting asks you to do. My AD was able to figure out a workaround to this, but it is counter to the on-screen directions. For our production, we ended up abandoning the app after a few scenes, using the iPhone’s iPod to start/stop playback and slating with a traditional Earl clapper for all scenes that did not have direct lip-sync. To add insult to injury, I exported the XML files to the Editor for FCP and walked him through the process of linking the log to the clips, and he decided that the process was too cumbersome and that he’d sooner do it manually or use PluralEyes. This was mainly because we had not figured out a way to match shot names to file-names generated by the camera. A tutorial might be helpful here. In my opinion, as of version 2.1, there are still some problems associated with Music Video Mode. Overall, I was happier I had my dry-erase slate, and wish I’d spent my $20 on a better lunch and a couple of fresh dry-erase marker. I’d recommend to the author that you hire a working script supervisor to further develop the app features. It’d also be great if you could send them out into the field to set-test the app. It’s potentially a 5-Star app. Based on my experience I’m giving it a 3-star rating. Thanks for the thorough post, Director/DP! I’m bummed to hear about your troubles. It sounds like you really pushed the app to its limits (and past). I’ll make sure the app’s developer reads your post. I’m sure they’ll want to address all the bugs and usability issues. @Director/DP: thanks for the bug report (and Taz: thanks for alerting us). We’re working on a major 2.2 update right now, and will certainly address the issues you reported. By the way, the most reliable way to report bugs like this is from MovieSlate’s app screen, or from our website’s "contact" screen. Dealing directly with us affords us the opportunity for a dialog, which can often speed up the debugging process. • Added option to "Show slate when shot ends". When this option is off, you can continue taking notes and rating the current shot without having to visit the History tab. • "Prevent Sleep" now functions properly (had to work around a system bug). • Songs continue playing after sleep on iOS4. • Fixed crash in History tab. To assist with tapeless workflows we’re investigating ways to incorporate camera filenames into the History and FinalCut XML. Thanks for the super-fast response, Taz and Cliff. Great news that you’re working to fix these glitches. There’s nothing else even close to the look and functionality of this app that I’m aware of. It’s potentially game-changing. For me it’s the single app that would justify an iPad purchase by itself. Looking forward to testing out v2.2. @Director/DP: we have released the 2.2 version, so you might want to give it another try now. I think we’ve managed to resolve all your issues. Performance is much better now, you can take notes after the shot has finished, and we’ve added a new auto-incrmenting filename field to the new Camera Optics tab that also appears in History and on leader and end roll animations. 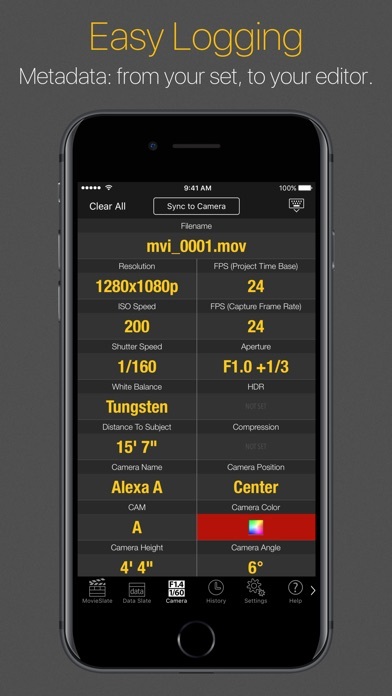 Great app, best camera log app out there. Did have one problem, reported it on web site, fixed next update.